Located at Walter E. Washington Convention Center, Washington DC, USA, Energy and Mineral Resources Minister Ignatius Jonan became the keynote speaker at the 27th World Gas Conference (WGC), held on 27 June 2018 local time. In the discussion titled What Next for The Asia Pacific Gas Market, Minister Jonan said that gas demand in Asia will continue to increase along with economic growth especially in China, India, South Korea, including Indonesia. Even for the ASEAN region is estimated in the period 2017 - 2035, of additional power capacity is expected to reach 270 Giga Watt (GW), 49 GW of which will be supplied from gas. "In Indonesia, gas has taken an important role, where the share of gas in the energy mix will increase to 22% by 2025 and 24% by 2050. Currently, about 62% of Indonesia's gas is used domestically with the electricity and industrial sectors as the largest gas consumer , in addition to being used as raw materials in the fertilizer industry, domestic LNG, lifting, city gas and transportation, "said Minister Jonan. Responding to a question moderated by Nobuo Tanaka, who is also Chairman of The Sasakawa Peace Foundation and former Executive Director of International Energy Agency (IEA) on Indonesia's prediction of gas importer by 2040, the Minister of Energy and Mineral Resources said it could be true, but it should be noted that Indonesia is now has two mainstay gas projects in the future. "Indonesia has just agreed to develop a large gas field in the Makassar Strait, namely Indonesia Deepwater Development (IDD) by Chevron and Masela Block by Inpex and Shell, and the prediction (IEA) may not have considered the presence of these two big projects," said Jonan. Chevron's IDD Project and the Abadi field development in Masela Block are two giant gas projects that are included in national strategic projects. From the Masela Block and the deepwater project (IDD) in the Gendalo and Gehem fields, Makassar Strait, Indonesia can get a substantial supply of gas. Although domestic gas needs can be fulfilled from national production, Jonan further said, the Government of Indonesia is not a government anti-import gas. "If local gas producers are inefficient and provide high prices, then the government will open imported taps," he concluded. 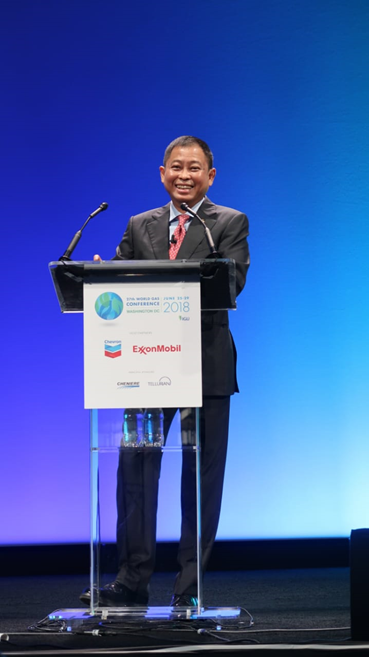 In addition to Jonan, the speakers in this forum include Yalan Li, Chairman of the Board of Directors of Beijing Gas Group, Executive Vice President & CEO Upstream PETRONAS Anuar Taib, and JERA Chairman Hendrik Gordenker. WGC itself is a 3-year event organized by a country that holds the presidency of the International Gas Union. In Washington, this event is the 27th conference after three years ago held in Paris, France. The WGC was attended by influential leaders in the fields of energy, entrepreneurs from various countries, as well as members of the US Senate and Congress. In addition to being a keynote speaker at the US Visit also used Minister Jonan and the Indonesian delegation to attend the dialogue between APEC energy ministers with the CEO of LNG Company, a meeting with the US-Asean Bussiness Council, attending CSIS-Pertamina Banyan Tree Leadership Forum, with the people of Indonesia to explain the development of oil and gas sector performance.